Aspirin. To Take or Not to Take. If you are over 50, your doctor has probably mentioned that a single 81 mg aspirin taken daily can help prevent a stroke (if you’re a woman) or a heart attack (if you are a man). Your doctor might even have mentioned that at stores you can buy a 500-count bottle for about $2.59, or about half a penny per pill! If you insist on buying brand name, then “safety” coated Bayer® aspirin will cost you about 3.25 cents per pill, and Bayer® chewable orange flavored aspirin will cost 5.3 cents per pill at BJ’s Wholesale Club. Imagine spending less than six cents a day to get brand-name prevention of a stroke or heart attack! Too good to be true, right? Right! It is too good to be true. No, your doctor isn’t on the payroll of “Big Aspirin.” In this case, unlike in other cases, wherein pharmaceutical companies have swayed physicians’ opinions through promotions, clipboards, pens, dinners, and other insidious persuasive techniques (can you say “Oxycontin”? ), doctors have just been wrong. Science does not progress linearly and we make recommendations based on studies, and sometimes newer studies disprove what we all believed to be true based on older studies. In the fall of 1982, the landmark Physicians’ Health Study was begun to test the benefits and risks of aspirin in the primary prevention of cardiovascular disease. The original randomized trial ended in 1995. It found that low-dose aspirin decreased the risk of a first myocardial infarction by 44%. Wow! We should all take aspirin! Later studies made us hedge on this recommendation. 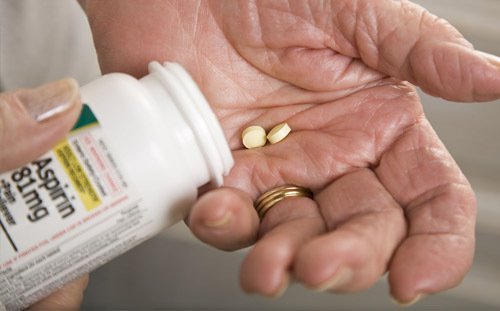 The United States Preventive Services Task Force (USPSTF) recommended in 2007 (and again in 2009) that patients take aspirin for primary prevention of cardiovascular disease (CVD) if the benefits outweigh the risks of gastrointestinal (GI) bleeding. In 2016, the USPSTF revised the recommendations to apply only to patients between 50 and 59 years old, with the prerequisites that patients have a 10% or greater 10 year CVD risk, have at least a 10 year life expectancy, are willing to take aspirin daily for 10 years, and are not at increased risk for bleeding. For adults 60 to 69, they said it was a values-based decision for individuals. They stated that there was insufficient evidence to assess the risk-benefit balance in adults younger than 50 or adults older than 69. Which brings us to today. In 2018, three large trials were published to address the issue of using aspirin for primary prevention of cardiovascular events (ARRIVE in September, ASPREE in October, and ASCEND, also in October). All three studies, performed on slightly different populations, came to the same conclusion: aspirin is NOT safe and effective for primary prevention of cardiovascular disease. In the first two studies mentioned, aspirin was no better than placebo for preventing heart attacks, and even caused significant amounts of major bleeding events. In ASPREE, aspirin had a 14% higher rate of all-cause mortality, compared to placebo! In the third study, ASCEND, there was a 12% relative reduction in cardiovascular endpoints, but a 29% greater rate of major bleeding. What does this all mean to me, as a physician, and to me as an adult between the ages of 50 and 59? I need to change my recommendations to my patients (DO NOT start taking aspirin to prevent heart attacks!). I also need to stop taking an 81 mg aspirin every night. It is not doing me any good, and might even be doing me some harm!